Every month, we tell you about a new product or company that has completely wowed us. It's called We Heart, and if you subscribed you’ve seen us rave about algae supplements, coffee bean chocolates, and even other skin care companies. Which company’s mission inspires you? What product has wowed you with its natural ingredients? What have you started using that has changed your daily routine for the better or helped you be more healthy? To make things fun, we’re turning it into a contest. Tell us what you think is so awesome that we should feature it on We Heart. We’ll give 10,000 Loyalty Rewards points to the person with the winning nomination. So if we decide to feature the product or company you recommend, you get the equivalent of $100 to spend on any of our products! If you haven't already, subscribe to We Heart. 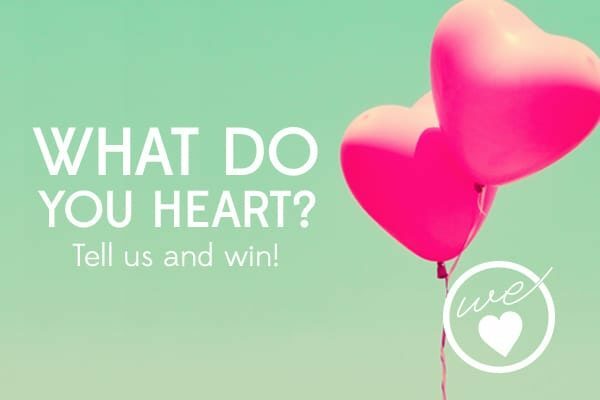 Only We Heart subscribers will be eligible to win. Email [email protected] to submit your nomination. It can be a specific product or a company in general that you love. Helpful things to include are the website and contact info, if you have it. In your email, tell us what you love about it! If you don’t know already, take some time to read up on our We Heart values (below) and find out what we look for when vetting our We Heart features. Valentine’s Day (February 14) will be the last day we take submissions. Natural – Products that are free of synthetic chemicals and GMOs, with an emphasis on unprocessed and high-quality ingredients. Fair – Companies that treat their employees and those they do business with well, providing benefits and incentives for their staff and paying fair prices for raw materials and crops. Of course, critters count, too! We don’t support animal testing or cruelty. Craft – Products made artisanally and/or in small batches, with thought and intention. Wellness Oriented – Products or services that keep people’s minds and bodies healthy, and companies that are working to make the world a better place. Conscious – Companies that take their environmental impact seriously, and make an effort to keep their carbon footprint low. We're so excited to learn about what YOU love and discover some amazing products. Make sure to tell your friends about this contest. Subscribe to We Heart and email [email protected] with your suggestions. Contest ends on February 14. Winner will be announced shortly after! Love the Drunk Elephant Virgin Marula™ Luxury Facial Oil. I also appreciate the story behind the creation of Drunk Elephant. Have been wanting to try the Lippe, but it is always sold out.